Ismail Haniyeh hails expected ceasefire with Israel as a triumph, tells Gazans Israeli security restrictions will be lifted. The leader of the Hamas terror organization touted the expected signing of a ceasefire agreement with Israel as a triumph for the terror group, telling residents of the Hamas-ruled Gaza Strip Israeli security restrictions on the coastal enclave would soon be lifted. Ismail Haniyeh, the chairman of Hamas’ political bureau, addressed Gazans on the eve of the Eid al-Adha holiday, set to begin Tuesday night, claiming that the terror group’s “steadfastness” had delivered a victory for the Strip, which would soon see the end of the security blockade put in place following the Hamas takeover of Gaza in June, 2007. Haniyeh also claimed that future aid to the Strip would not be conditioned on any changes to Hamas’ behavior or its policies in Gaza. The Hamas leader also referenced President Donald Trump and the much-anticipated peace plan, which the US is expected to present next month according to a recent report. 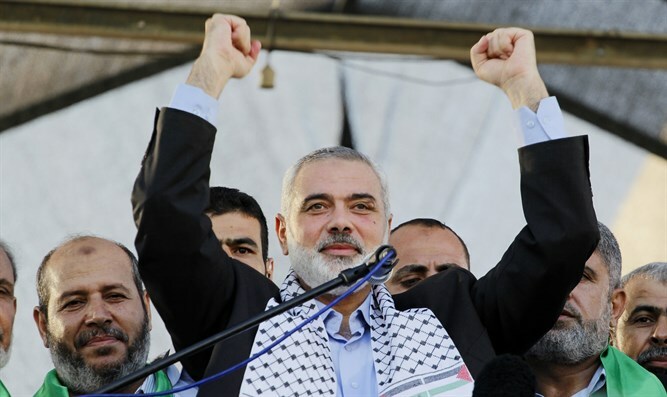 Haniyeh said Gazans could expect good news in the near future, “despite those who are plotting”. Israeli Defense Minister Avigdor Liberman has pushed for a ceasefire agreement with Hamas, brokered through the Egyptian government, following an upsurge in violence on the Gaza border. In recent weeks, Gaza-based terrorists have launched numerous attacks on Israeli targets, including dozens of rocket attacks, a shooting attack which killed one Israeli soldier, and attempted infiltrations into Israeli territory. Senior Hamas officials recently claimed that negotiations have made significant progress, and that a ceasefire is expected to be reached next week, following the Eid al-Adha holiday.